It has been eight hours since we last talked – sleep eludes me and memories keep flushing down, sometimes as tears. Our day, 27th July, began at 12 noon, when we took our seats in the flight to Guhawati. Dr. Kalam was 1A and I was IC. He was wearing a dark colored “Kalam suit”, and I started off complimenting, “Nice color!” Little did I know this was going to be the last color I will see on him. Long, 2.5 hours of flying in the monsoon weather. I hate turbulence, and he had mastered over them. Whenever he would see me go cold in shaking plane, he would just pull down the window pane and saw, “Now you don’t see any fear!”. That was followed by another 2.5 hours of car drive to IIM Shillong. For these two legged trip of five hours we talked, discussed and debated. These were amongsthundreds of the long flights and longer drives we have been together over the last six years. As each of them, this was as special too. Three incidents/discussions in particular will be “lasting memories of our last trip”. Our second discussion was more national. For the past two days, Dr. Kalam was worried that time and again Parliament, the supreme institution of democracy, was dysfunctional. He said, “I have seen two different governments in my tenure. I have seen more after that. This disruption just keeps happening. It is not right. I really need to find out a way to ensure that the parliament works on developmental politics.” He then asked me to prepare a surprise assignment question for the students at IIM Shillong, which he would give them only at the end of the lecture. He wanted to them to suggest three innovative ways to make the Parliament more productive and vibrant. Then, after a while he returned on it. “But how can ask them to give solutions if I don’t have any myself”. For the next one hour, we thwarted options after options, who come up with his recommendation over the issue. We wanted to include this discussion in our upcoming book, Advantage India. Third, was an experience from the beauty of his humility. We were in a convoy of 6-7 cars. Dr. Kalam and I were in the second car. Ahead us was an open gypsy with three soldiers in it. Two of them were sitting on either side and one lean guy was standing atop, holding his gun. One hour into the road journey, Dr. Kalam said, “Why is he standing? He will get tired. This is like punishment. Can you ask a wireless message to given that he may sit?” I had to convince him, he has been probably instructed to keep standing for better security. He did not relent. We tried radio messaging, that did not work. For the next 1.5 hours of the journey, he reminded me thrice to see if I can hand signal him to sit down. Finally, realizing there is little we can do – he told me, “I want to meet him and thank him”. Later, when we landed in IIM Shillong, I went inquiring through security people and got hold of the standing guy. I took him inside and Dr. Kalam greeted him. He shook his hand, said thank you buddy. “Are you tired? Would you like something to eat? I am sorry you had to stand so long because of me”. The young lean guard, draped in black cloth, was surprised at the treatment. He lost words, just said, “Sir, aapke liye to 6 ghante bhi khade rahenge”. After this, we went to the lecture hall. He did not want to be late for the lecture. “Students should never be made to wait”, he always said. I quickly set up his mike, briefed on final lecture and took position on the computers. As I pinned his mike, he smiled and said, “Funny guy! 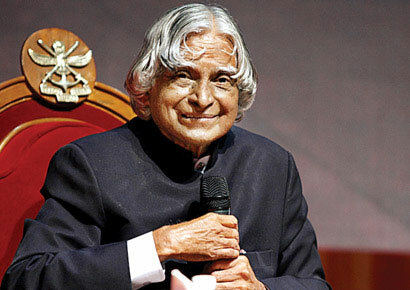 Are you doing well?” ‘Funny guy’, when said by Kalam could mean a variety of things, depending on the tone and your own assessment. It could mean, you have done well, you have messed up something, you should listen to him or just that you have been plain naïve or he was just being jovial. Over six years I had learnt to interpret Funny Guy like the back of my palm. This time it was the last case. “Funny guy! Are you doing well?” he said. I smiled back, “Yes”. Those were the last words he said. Two minutes into the speech, sitting behind him, I heard a long pause after completing one sentence. I looked at him, he fell down. We picked him up. As the doctor rushed, we tried whatever we could. I will never forget the look in his three-quarter closed eyes and I held his head with one hand and tried reviving with whatever I could. His hands clenched, curled onto my finger. There was stillness on his face and those wise eyes were motionlessly radiating wisdom. He never said a word. He did not show pain, only purpose was visible. In five minutes we were in the nearest hospital. In another few minutes the they indicated the missile man had flown away, forever. I touched his feet, one last time. Adieu old friend! Grand mentor! See you in my thoughts and meet in the next birth. As turned back, a closet of thoughts opened. Then something he said two weeks back when we were discussing about his missile time friends. He said, “Children need to take care of their parents. It is sad that sometimes this is not happening”. He paused and said, “Two things. Elders must also do. Never leave wealth at your deathbed – that leaves a fighting family. Second, one is blessed is one can die working, standing tall without any long drawn ailing. Goodbyes should be short, really short”. Today, I look back – he took the final journey, teaching, what he always wanted to be remembered doing. And, till his final moment he was standing, working and lecturing. He left us, as a great teacher, standing tall. He leaves the world with nothing accumulated in his account but loads of wishes and love of people. He was a successful, even in his end. Will miss all the lunches and dinners we had together, will miss all the times you surprised me with your humility and startled me with your curiosity, will miss the lessons of life you taught in action and words, will miss our struggles to race to make into flights, our trips, our long debates. You gave me dreams, you showed me dreams need to be impossible, for anything else is a compromise to my own ability. The man is gone, the mission lives on. Long live Kalam. don’t miss out on associating with your roots. arises how do, we have such a committed and dedicated workforce. intelligent enemy than a foolish friend. Masaan - Poetry of 'bambooed' pyres.